shopspaViolet is Serious Skin Care, Serious Fun: Ugh my pores are too big, how do I shrink them ? Blackheads are a large contributor to large pores, when the pore becomes clogged by skin debris and bacteria the pores diameter will expand. The presence of large pores may be significantly reduced by the use of retinol and vitamin C. These ingredients not only loosen dirt and oil from the pores, they increase collagen and elastin production , thus serving a dual purpose in the quest for flawless skin. Exfoliation will minimize the appearance of large pores and may be accomplished at home using an at-home facial scrub or more aggressively by visiting a medi-spa or dermatologist. More invasive treatments by a dermatologist such as chemical peels, Intense Light Pulse Photofacials ( IPL ) and laser treatments are highly effective as well. And lastly, never, ever underestimate the use of a good makeup foundation. 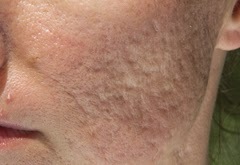 These may likewise acne treatment smooth out the skin's appearance and even staining from over introduction to the sun. Acne...Everyone has encountered some type of it whether it is a pimple angelina jolie skincare all over or a genuine instance of skin break out which is both physically and sincerely scarring.